feathers flapping enthusiastically towards the fox-filled wilderness. heritage; making sure that the animal led a happy life, raised in good conditions. I learnt the method of twice-cooking pork belly a couple of years ago - it's a winner. Heat your oven to 150C/fan 130C/gas 2. Crush the Panch phoron in a pestle and mortar, add salt, then rub the mix into the pork belly. Place the pork belly skin side up in a deep, oven-proof dish, then completely cover with vegetable oil (so that it's submerged - don't worry, the oil won't soak into the meat, it actually draws fat out). Cover with foil and cook in the oven for 3 hours. Remove the meat from the oil and let it cool for a bit on a board. Put piece of greaseproof paper on a baking sheet, then transfer the meat onto the paper. Place another sheet of greaseproof on top of the meat, then complete the sandwich with another baking sheet on top. Weigh down with tin cans and leave in the fridge overnight. Heat the oven to 220C/ fan 200C/ gas 7. 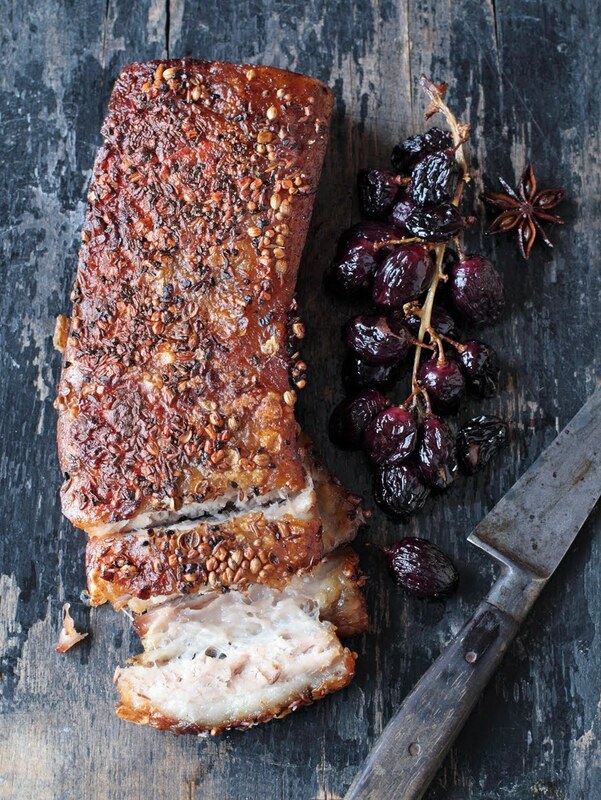 Put the pork in an oiled baking dish, nestle the grapes next to it and drizzle with olive oil. I wedged a star anise in between the grape stalks for a bit of extra flavour. Roast the 20-25 minutes, 'til the pork skin is crispy, and the grapes are squidgy. Hi Stuart. I'm halfway through making this (the pork is in the fridge) and all going well. Just a question - why put the weights on top when it's in the fridge? I'm only asking because I know, if this works out and I pass the recipe onto someone else, they'll ask me too!